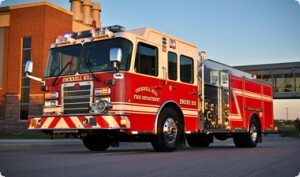 Twice last month, Flagler Beach Fire Department personnel acting as representatives of the city took unauthorized trips to two manufacturers of fire trucks–one in South Dakota, one in Wisconsin–to shop for a replacement fire engine. Bruce Campbell, the city manager, knew nothing about it–an affront to his authority, particularly given the way he found out about it. Flagler Beach martin Roberts and two other members of the fire department traveled in early June to Rosenbauer America‘s South Dakota plant in Lyons. They did not spend city money. Nor did they do it on city time. They took vacation for the three-day trip. But Rosenbauer picked up the cost of the entire trip, including air fares, hotel and meals. The company has a program that underwrites prospective buyers’ trips. Still, ethical issues are in play when a company wines and dines public employees, especially when there is either a probability or an expectation of a transaction. A second trip took place last week, to Wisconsin–to Pierce Manufacturing’s Appleton plant. Fewer details are available about that trip, which may have involved only one member of the department. Campbell is investigating the matter. The controversy has been making the rounds of every rumor mill in town and leading to speculations about the fire chief’s fate, including his firing. “That hasn’t been determined yet,” Campbell said when asked about the chief’s job. The city manager hires and fires the fire chief, but the commission may, under the city’s code of ordinances, investigate potentially unacceptable conduct by city employees. The meeting was cancelled earlier today, and rescheduled to July 10 at 5:30 p.m. The reason for the cancellation, according to the deputy city clerk, was that Friday’s notice of the meeting had not been sufficient. The notice went out electronically from the city’s office through an email blast. But according to city code, “The agenda for such meeting will be posted on the bulletin board next to the front door of city hall no less than seventy-two (72) hours prior to the time the meeting is scheduled to convene.” That posting did not occur Friday, Jane Mealy, chairman of the commission said. Mealy does not see a controversy. The city commission, she said, had granted Roberts permission to travel to New York State to take a look at a truck several weeks ago. “By rthe time he got around to going, the truck was sold,” mealy said. Roberts then heard about the truck in South Dakota and about another one in Wisconsin, and took vacation time to investigate. Flagler County has attempted several times to absorb Flagler Beach’s fire department but faced intense resistance every time. This issue may revive the push for consolidation, especially as it centers on a pumper truck that, while needing between $25,000 and $30,000 in repairs, has only 48,000 miles on it. County trucks have twice as many miles and still run. The pumper truck is a spare that the fire department wants to replace. Mealy said that the truck is itself worth just $25,000. She doesn;t dispute that the repairs are doable. But even if the repairs were conducted for that same cost, it would still be a $25,000 truck in the end, she said. So let me get this straight: the fire chief was given the authority by the city commission to explore other trucks. He, and other members took vacation time and went on a trip to investigate the city’s options to make a well informed buying decision at NO COST to the city . . . and this is a problem how? I come from a long line of firefighters and have many friends still in the business and it is customary for manufacturers to facilitate tours of their facilities. In doing a little of my own “independent research”, I have learned that at any given time there are over 30 other members from various departments at these types of tours. As for the hospitality, there is no implied sale so how is this unethical? As for the discussion of consolidation, the city would be foolish to allow the county to handle their fire services. They are never in their stations, they have different personnel every week rotating all over the place. The city firefighters know their area, they know their people and they know their needs. There is a lot to be said for a familiar face in your time of need. The county’s trucks, by the way, are CUSTOM pumpers (the same thing the manufacturers above make). This is why they are lasting. The city for years has bought very basic, bottom of the line fire apparatus to squeak by and while it accomplishes the job, it doesn’t do so as long as a custom fire truck would. One would venture to say this is another move by the city to hurry up and handle an issue without clearly looking at all the facts and shame on the city manager if he is rushing into something with the fire chief, while he is only doing his best in what appears to be a search for the best purchasing option for the city. I can’t help but notice most of these comments posted are very knowledgable on this situation much more than the average citizen would be. Which leads me to believe that they are in some way shape or form associated with the FBFD. It makes me wonder though. Why are these individuals posting comments anonymously, also why so defensive for their position and attacking the politicians involved and the county fire dept that apparently was only referenced as a comparison. I will be curious to see all the facts when they are presented. So it is okay for the county to run the ambulance out of Flagler Beach, but not the fire service? I fail to understand your logic in this. The rescue unit currently is staffed and run by county employees. Flagler Beach is not that big, so the logic of knowing the area is trivial at best, we are not talking a major metropolis here. Next – county employees on the rescue are on that truck every third day, so while the face may not be the same on Monday as it is on Tuesday or Wednesday, they return every third shift back to their assigned station. Station switches do not occur weekly, but typically every six months or so. If there is a switch it is due to a sickness, vacation or unexpected circumstance. As to a familiar face in my time of need, I would prefer someone qualified over familiar, especially since most calls run in any given city or county is a medical call, not a fire call. As to them never being in their stations… do you even know which stations have county employees and which are volunteer based? Or are you once again making random generalizations in an effort to make a failed point? Am I saying the city guys are incapable, no. Am I saying they are inferior, no. At the same time though, give the county guys credit for the work and knowledge they do. They know their territory. They know the job they must do. They do not get to be the public whipping boy for an issue between the Flagler Beach Fire Department and the city commission. As to the overall story – did the chief do anything wrong? Not intentionally, but having a company wine and dine you usually gives an implied consent to that company. Is it common practice? Yes, these trucks are a quarter of a million to over a million dollars a piece depending on design and capabilities. The fire chief, while not a politician is a public figure and needs to be transparent in his endeavors and get the best deal for the residents of Flagler Beach while not skimping on items that will last. Yes, a custom truck is better. You can tailor it to the needs of the department. But keep all dealings with the truck companies above board. After reading this article I would like to say a few things and get straight a few things that I know as fact. The private citizen that Campbell Talks about he got a email on his private email from is not a private citizen in the loose sense of the word as he is very active in writing letters and making accusations publicly such as the sign situation in town.. He is Art Woosley the head of the group that wants to get rid of the fire dept to begin with. Art is behind this whole thing to start the ball rolling towards that movement again. Art Woosley and his buddy the city manager wants the chief gone so as to make this purchase of the new truck go away. Steve Settles is also one of Art Woosleys underlings and is also wanting the chief gone even though he will stand there and tell you otherwise. It is funny how everyone seems to have forgotten the March meeting when the commission gave there permission along with the city managers permission and $500 to do these visits and bring back information on the trucks. Art was so upset then that he wrote in the Palm Coast Observer about this and made a call then for his firing, but while he was whining about the truck he said that they need to be looking at new trucks for the same price. ( What the hell Art?????? )Are you getting a cutback from Pierce or is that what was used down south. The question is look at how they almost got the chief railroaded out because look how quick they call a meeting and tried to sneak it in without the proper notice time. How ETHICAL is this. a 50 hour notice over the weekend is this also in the sunshine law for quick fires. IF THE CHIEF IS FIRED I WOULD LIKE THE CITY MANAGERS JOB GO ALONG ALSO FOR MISMANAGEMENT OF HIS POSITION. I AM ALSO MAKING A CALL OUT TO THE SUPPORTERS OF THE FIRE DEPT TO MAKE THERE PRESENCE SEEN AT THIS MEETING ON TUES THE 10TH AT 5:30 STOP THIS ATTACK BY WOOSLEY AND HIS GROUP BECAUSE I AM SURE HE AND HIS PEOPLE WILL BE THERE ATTACKING THE FIRE DEPT. FOR WANTING TO IMPROVE THERE EQUIPMENT AND DOING THERE JOB. PLEASE COME TO THE MEETING AND SUPPORT THE FIRE DEPT BECAUSE THIS WILL BE THERE BACK DOOR INTO GETTING RID OF IT IF IT IS NOT STOPPED NOW. I would like also to say is that the truck in question is a 96 Freightliner that is a standard truck chassis for a delivery truck at a cost of $150,000 that is worn out. The county trucks of which you write are custom trucks chassis such as the ones these guys were looking at that are made for fire trucks and are made to do the job without rotting away do to salt air. You say there trucks are still running well that is true as they have a permanent maintenance garage that these trucks are worked on. There trucks break down also and quite offen check there records. This is a WITCH HUNT at the expense of the safety of the good residents of Flagler Beach. And Bruce Campbell is totally unfit to do this job if the Chief is fired for doing his. Mealy does not see a controversy. The city commission, she said, had granted Roberts permission to travel to New York State to take a look at a truck several weeks ago. speculations about the fire chief’s fate, including his firing. Please…these men and women put their lives on the line for us day in and day out. They run IN to fires, not away from fires and all manner of other horrors. Respectfully…can we possibly kick this down a notch. Way bigger issues facing all fire departments in these financially challenged times. And from just one grateful citizen…Thank You Fire Fighters…heros all. Really? So, the firefighters used their vacation time to take the trip. Why is this even an issue? The BIG OLD “TOUGH” politicians want to abuse their power and make an issue out of this? Sounds to me like the fellas were trying to see what improvements they could make to the department. As obviously the city is not. “The fellas” are the city! Sounds like we have too many politicians since they have nothing to do but whine about the fire department taking care of their own business. Where are you Art? Willing to answer to any of this? The comments above are frankly amazing. Had this been a politician taking a trip paid for by potential vendor to the city you would all be demanding the politician resign. But because it’s the fire chief it’s okay. Should the chief be fired based on the above article? Probably not. It seems he was probably just trying to find the right piece of equipment for the City. But he needs to undergo some remedial ethics training. He’s probably a decent chief, but obviously lacks basic knowledge about public purchasing. The fact is when you’re dealing with public funds, the mere appearance of impropriety is as bad as impropriety. You cannot accept free travel and free meals from a vendor who wants to do business with the city, the entry level purchasing clerk learns this on their first day! To Johnny Taxpayer-The critical point you are obviously overlooking here is that the Fire Chief received the approval/authorization from the City Commissioners to do exactly what he did and at no cost to the City. In addition, this was done by the Chief using HIS VACATION TIME. Anyone who wants to question the dedication of this man and his staff need not look any further than that statement. Time that could have been spent with his family was, in turn, spent working to improve the safety of the citizens of Flagler Beach and people want to call for his firing-need for ethics training, etc! Those that say that should be ashamed of themselves. I for one as both a resident and business owner of Flagler Beach are extremely proud of the dedication from both the paid staff and volunteers who continue to put their safety ahead of everyone else. You want to rely on the County for your fire services…good luck. it’s tough enough now to count on an ambulance being close hoping that they are not on a transport to Orlando or Jacksonville or Gainesville.And for any of those people involved with “stirring the pot” and continuing to push for the County to take over, please keep in mind that this is not South Florida, this is a town which appreciates and acknowleges it’s identity through a number of common threads including its Fire Dept. A critical point you are missing is that the City Commission did not approve the trips in question. As the article states, the Chief was approved to go to New York, but the truck was sold. Ethics 101, if you’re in a position to steer business to a City vendor (as the Chief obviously is), you cannot receive anything of value from that vendor. You can go any government entity in the United States and you will find that this is the rule 100% of the time. Umm, If the trip was needed, as determined by the City Management, not the Chief, then to avoid any appearance of impropriety, the city should have paid for the trip. In no case should a potential vendor provide meals, travel, hotel, or anything else of value to a person who has the ability to steer business to that vendor. I personally think the investigation of this matter is silly. However on the subject of consolidation, I happen to think its a great idea. 90% of the 911 calls in Flagler Beach are medical which is handled by the county anyways. I think we would benefit more as residents if the two departments became one as long as nobody loses their job. Plus we would stop being double taxed for the fire services. Because if your not aware, we pay taxes to both Flagler beach and the county fire departments. If they merge together our fire house here on the beach will have better resources and equipment. Stop all the silly politics and for once let’s do what’s best for Flagler Beach’s residents. I am an involved taxpaying citizen of Flagler Beach and, do see some impropriety with the Fire chiefs action. Why would anyone in their right mind accept a free trip with out authorization from their superior or commission vote is beyond me. As Johnny taxpayer says” What if it was a commissioner or city manager getting “free.trips and lodging, would everyone not be screaming”.. I have nothing against anyone who works in any dept of Flagler Beach, but there seems to be a problem when you lie by omission. If it wasn’t a problem why wouldn’t you just go through the proper channels????? As a proud volunteer member of this department, speaking only for myself as a resident of Flagler Beach and a taxpayer… I want to thank the citizens above for your kind words and rational thinking. These types of trips are common place in the fire service, other agencies in this county have gone on them just this year and it is hardly newsworthy. The difference is that normally you the taxpayer normally foot the bill as part of the purchase price for a new pumper once the government entity signs a letter of intent to purchase. The city government directed the Chief to gather more information before they were willing to undertake any such commitment. In response to this, these men went on their own time. They have no authority to enter into contracts nor did they try to do so. There is no ethical issue because there is FULL DISCLOSURE. Clearly so many people knew about it that it was hardly a secret or in any way made to be a “secret”. As the article states a private citizen “informed” the city manager. My question is this… how is it that the commissioners knew of this, that private citizens knew of these trips, that other departments in the county knew of this, yet somehow the manager of our city did not? Is he that out of touch? Are we really to believe that the Fire Chief was sneaking around *him* while clearly making no effort to hide the trips to the rest of the world? I would encourage all of you to remember that there is always a motive involved, someone always has something to gain while trumpeting the public interest in service to themselves. I will give you my motive and that of my brothers and sisters who serve *you*, paid and volunteer alike… we want to make sure we have the most reliable, capable, safe, and efficient fire apparatus we can get. We want to go home to our families after every shift and we want to be prepared to answer your calls for help so that you can go home to your families as well. That is our motive and nobody has made any effort to hide it from anyone, what is their motive? Mr. Johnson, going “on your own time” if you’re talking about just a vacation is fine. Combining that with official business is a violation of ethics. There is a set of rules for how this must be done to avoid the appearance of impropriety, rules that are there to protect the Chief and the taxpayers. While nobody is questioning your capability to do the job, we are trying to explain why the chief is in trouble. Had he followed the rules, this would not be the case. We here in Flagler are quite proud of our fire fighters. Next time, follow the rules and you won’t get into trouble. @Roy – “Commonplace” does not make it right or ethical. Their may be motive involved, but whenever special treatment is involved to an official, that is a definite NO. That’ why we have ethics rules. “Everybody does it” is a sorry excuse for a public offical’s behavior. The public trusts you to follow these rules. When you don’t because “everybody does it”, you ruin that fine reputation as well as the public trust in you. Politicians do this sort of thing all of the time. Don’t they call it a fact finding mission? Federal representatives travel around the globe. Most times it is on the taxpayers dime. Johnny Taxpayer, how then would you suggest they have made the trip?! Would it have been okay for them to use the city’s money and residents tax dollars!? They obviously couldn’t afford the trip on their own dime, those men and women barely make enough money to support their families. They were only trying to do right by their city and it’s people by finding the best deal on the apparatus that protect and save them! Shame on whoever is trying to turn this into a controversy is so obviously is not. We should be applauding these men for taking the initiative to leave their families to go on a trip that is benefiting the city. I’m all pumped up after reading this article. To the Commissioners: Beyond asking questions about an employee’s job activities, “ Thou shall not interfere in the City Manager’s authority over staff” No orders, no input, no nuttin. I don’t believe our fire department is, as one previous City manager opined, “ a snake pit” I do, however, believe from my previous experience, that there are some serious issues that need to be addressed. Please allow the City Manager to handle it as he sees fit. Yes Ron you did your best to get rid of the Fire Chief but Bernie Murphy told you The Chief was doing his job and he would NOT fire him. So now you have another chance. YOU were wrong then and your all are wrong now. The only drama at the fire dept is what you all make it to be. everything to do with flagler beach politics is shady and a clusterf—. gator, that is what happens when you stop following the rules and allow the ethical lines to blur. The worst part is that not nearly enough in Flagler are paying attention or care. As long as that is the case, we all suffer with sub standard government. First and for most I’d like to have somebody explain where they are coming up with double taxation. As once again I have looked over my tax bill from last year and all I see is general funds for the city of Flagler Beach and County. Which basically go’s to pay for everything from the custodian, to the mangers in both jurisdictions. Nowhere is it broken down to each and every line item. So I wish people would stop miss using double taxation as a scare tactic or further justification for consolidation. On the subject of consolidation would it make sense? Save money? I say yes. But only if the all the municipalities would cut the budgeted amount from there general funds which we all know would never happen. Now the real purpose of this comment, I really think its small town politics and a witch hunt, something that continues to go on in the small community of Flagler Beach every day since I have lived in this county and city. We have other bigger issues to address, other than petty he said she said approvals. – I introduced the motion to purchase new turn out gear for those that were worn out and in tatters. -I introduced the resolution to install a mechanically assisted ladder lift for safety purposes. – I served as the City Commission safety contact to the F.D. during the 10 years of my service. So, don’t believe the spin that I am anti Firefighter. I will reiterate, I implore the Commissioners to allow the City manager to unravel this issue. Do not take sides, do not support either argument. Let the record speak for itself in the context of the City Charter. John Smith, push me and I will release a documented fact, one at a time, about the operation of the F.D. that will reinforce why I lost confidence in its management. Then, let the people decide. So, whoever you are, you certainly would not be opposed to that,right ? Ron, your a bully and everyone knows it. We’re all glad your gone. Enjoy retirement, nobody cares what you have to say because your just like Art and Settle . . . part of the “South End Clan” . . .
Ron, You don’t intimidate me at all. And yes when you were on the commission and you all took care of that problem at the time of it. The Fire Dept has changed for the better since then so don’t threaten me either I also have my info on your Fire service. Thank You. FB insider, bully, sure you can think of something more vitriolic than that. Come on-you guys are slipping. Now onto some good stuff. First a sentence or two regarding background. Back in 1999, I was hired by Flagler Beach as a Safety Professional to, among other things, clear up their Worker’s Compensation Program and install a DRUGFREE WORKPLACE PROGRAM. As written the Drugfree workplace program, as is traditionally stated: “After any type of workplace accident, regardless of fault, the principals will immediately consent to a drug test.” That was in the days when the Fire Departments budget was $90,000, ( now about $500,000) and folks were naturally interested in purging drug induced employees. For many years, my information indicated the program was followed. Then in 2010, I was informed, by a reliable source, that the Fire Department was not reporting workplace accidents. At the next safety meeting at the fire department, with two other top level administrators present, I questioned the chief about the accidents. One accident completely tore the bumper off a city vehicle and the other tore the door off the newly purchased Parade Ladder truck. A makeshift bumper was assembled by the Department in one case and in the other the cost of the door repair was buried in the budget. The answer from the chief was, “Those accidents happened two weeks ago, so it’s too late to report them”. (I’m not making this up, it’s in the record.) Well, as any high school freshman knows, common drugs persist in one’s system for 4 to 5 weeks. I’m not saying drugs were involved. But would one think management was doing its job by bypassing the Drugfree Workplace Program? You be the judge. A very serious management breech. I subsequently reported this to the City manager at the time and still no action was taken. Again, I know there as some good folks in the F.D., but there are some issues that need to be addressed. This is only one example. Ok Citizens of Flagler Beach, in the middle of Ron Vaths statement he starts with he was informed from a reliable source. Well his reliable source was one of four members of the dept that left the dept because they did get there way with the Chief and the Firefighters and the changes for the GOOD at the the fire station at the end of 09. I personally know the one who went to RON with his intent to discredit the Fire Station and all its members to get even and not only was there a visit to Ron Vath but a scathing letter to the commission of which Bernie Murphy and Libby looked into and was found to be unfounded. OMG yes the BUMPER was damaged on the attack truck and one replaced it at NO COST to the city and there was NO secret conspiracy to keep it from the city it just got backed into something and the Chief made a change that NO vehicle is to be BACKED up with out someone out of the truck to watch it. The DOOR of which you speak was scratched on the edge and unless you were shown where it was you would never KNOW so a drop of touch up paint took care of that at NO COST to the city and again the Chief made his order a do it or lose it meaning your job for NOT FOLLOWING HIS ORDERS. These Two incidents were reported to Ron Vath as serious damaging and to city property OMG. They were NOT and yes they were kept from Chief at the time being since he was out of town at both times. When he returned after being gone he was told of the problems and took his action with NO CONSPIRACY to hide the incidents as this person would like to of had Ron believe. Is what you are saying Ron is that if something is damaged in any Dept that is in the city whether it is a lawn mower from hitting a rock or a weed eater from breaking a string or damage to the backhoe from hitting a something or scratches to signs from falling over that the city should spend the money for drug testing that is ridiculous when drug testing is $145 a test come on, there is a time for testing then there is not, is it only the Fire Dept that has to live up to that. Its funny how this individual used everyone and did things himself with equipment of the city oh he must have forgot that but I have not or maybe that was his conspiracy that could have at the time and that is BEFORE Chief Roberts and the other Chiefs before him to get him removed or even jailed by the city. I know of his journey through time with the FD equipment so His credibility is ZERO with me and I am sorry that he used you also Ron he lied to you there was NO CONSPIRACY. Bernie Murphy and Libby both investigated this individuals claims against the Fire Dept and they were found to be unfounded by the 4 individuals that left with BAD feelings for the Dept and still do as of today and want the CHIEF FIRED thinking they will be welcomed back don’t think so. As for Chief Roberts he has done his job as being the Chief and handling the problems at the Station which is what he was hired to do and not having to be watched over his shoulders by the city manager or anyone else he is doing his job with respect for the city. Last Night at first Friday and individual approached Chief Roberts twice and disrespected him in front of the Public and his own men and women he represents. He got the first comment in but I’ll be damned if he was going to get to Chief again for the second one so I stopped him and I will not put up with any kind of disrespect to that position in public that was uncalled for and mean as this whole thing is way out of control for what it is about. The only thing serious about this problem is to the few that want the chief gone. We need our support to come to the meeting Tues at 5:30 to show our support to the chief with respect . Why is it that no one comes to the Fire Dept to do any investigating on there own they just believe what they hear. I mean NO ONE comes down there and does no asking of questions to find out the truth about anything or is it they just believe what ever they hear. We have our problems just like any other Dept. in this city and that does include city hall. If you hear anything questionable come and ask, what does it hurt its your station we have NOTHING to hide. You talked about a $90,000 budget in 1999 well its 2012 and $500,000 now sounds like the sign of the times don’t you think. 13 years of price increases on equipment. If this was such a big deal to you as a COMMISSIONER, why are we just now hearing about it? Furthermore, who is to say the city manager wasn’t told about it and failed to act? Now your just pulling out things irrelevant to the article to attempt to tarnish the fire department for the sake of your South End Clan. Let me guess, Mr. Woosely is pulling your puppet strings just like Campbell and Settles? Go to city docs and look at the agenda package for the special meeting on Tues. The city mgr was not told about the trip. A day late and dollar short to talk about what went on when you were a commissioner. You had many long years to do the right thing. Too bad you didn’t do it. This discussion is way off target. It’s not about the fire dept or the city mgr, it’s about the arrogance of some commissioiners who believe they can ignore the city charter and do an end run around procedures. Let me also clarify something else that Ron said. The truck that allegedly had a door “torn off” IS NOT a “Parade Ladder truck”. It is a truck the city commission approved to purchase at a great price that has proven itself several times since it’s purchase. FEMA doesn’t have anywhere further away for you to work? Mrs. Palmeri,,I went as far as I could without micromanaging or abrogating the authority of the City Manager but thanks for your sincere input.. Glad you are keeping current with this issue. 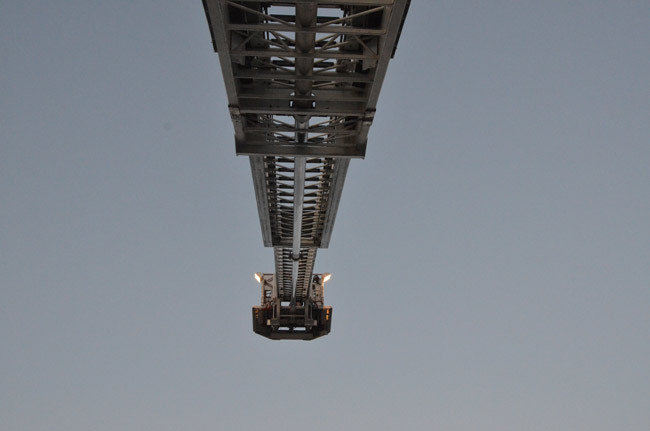 Let’s talk about the parade ladder truck. Sold to the Commission as a great deal a 20 year old piece of equipment for say $80,000. Couldn’t get it home without replacing dryrotted tires at a cost of $5000 . To outfit it cost another $20,000. All this upgrade and maintenance money never disclosed to the Commission, and extracted from the F.D. budget even though it was never budgeted. Only reflects how much “extra” has always been written into that budget. Keep in mind that surrounding communities have up to date equipment much better suited to fight our typical fire and they are all pledged to supply “mutual aid” in any situation. This truck with it’s accompanying ladder requires annual maintenance costs entirely inappropriate to a small city of 4500 population. Next, well be getting a request for a new ” parade truck ” at a cost upwards of $750,000. One last comment on this it is as they say where the cards may fall. Ron your informants failed to inform you that the Volunteer Association also picked up part of the tab on getting this truck ready for service it was not all on the city taxpayers thats what we do. This tower trucks service will probably out live you and me Ron so you did do a good thing. You talk about the county and Palm Coast having the same equipment to do the same job well that is a yes, now lets just suppose we have a fire and lets just say they are busy with there double equipment now the city is able to take care of itself and NOT depend on anyone for any kind of apparatus the people of Flagler Beach are taken care of by there own trucks and personel that they own with there own name on the side of them to be proud of. We do have a Mutual Aid Agreement with everyone so help is coming which will be appreciated but we will be there first with what ever is needed. and yes it looks good in a parade also. Other than the state inspection that is required by the state of Florida which is paid for by the city the Flagler Beach Volunteer Association has been picking up any other maintenance cost and not the city.Plus the truck is routinely maintained in house by our own personel. Again I would like to say if any resident out there wants to know anything about any trucks come and see for yourselves. As the stomach turns,,,,,, Here we go again. 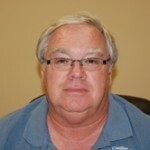 This man has brought humiliation to the City and the Woosley followers keep pulling the strings. Karney and Settle need to get a life and their facts straight. Campbell is a puppet that has no clue how to manage a City. Get him out of there!!!!! Get a professional manager to do the job right. How come we have him at the helm when he is so dirty? Wake up!!!!!!!! !